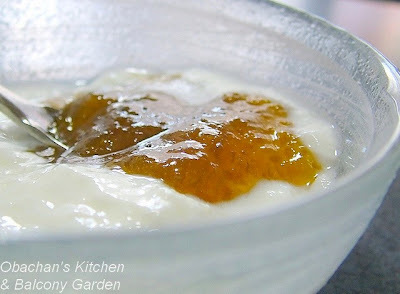 The ume jam looks so good with yoghurt. Thanks for sharing how to make the jam. Glad to see you are fine and ok after your hospital stay. 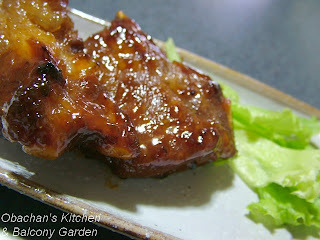 There's nothing like kitchen therapy when you've been under the weather. So nice to see you cooking and baking up a storm. These photos are lovely and the jam sounds wonderful. Oh, Hi!! Great to hear from you! Oh, another good old fellow blogger here! So glad to hear from you. I just visited your kitchen garden yesterday and admired your beautiful lettus. Thank you. I have 10 ume trees in my yard here in CA, and I can't speake to the old owner as she and I don't have the same language. 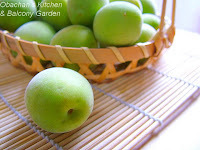 I always wanted to know what to do with my plums the trees are soo pretty and laden this year. I will definitely try your jam recipoe. Ten ume trees! It must be spectacular when they bloom in early spring! I'm glad to hear that my recipe may help. I guess it's better to stay on the safe side and remove harshness completely when you try this for the first time. 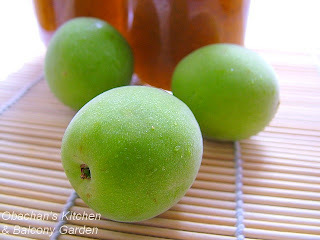 Looks like those who have been eating green ume jam for years get used to and enjoy slight harshness and sourness, but not beginners (like me). 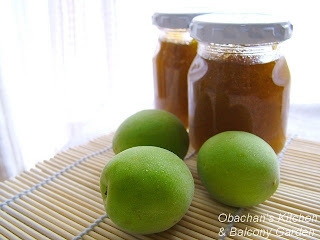 Obachan - I don't know why but I have a craving for umeboshi these days (and I'm not pregnant :)) Your pictures are gorgeous, the jam must taste absolutely delicious (and a handy thing to have!). The 'precious' blueberry tart looks lovely too. Soooooooo great to hear from you! Thanks for dropping by. It's no surprise that you crave for refreshing sourness as the weather gets hot. I hope it's not terribly humid over there ... like it is here right now.